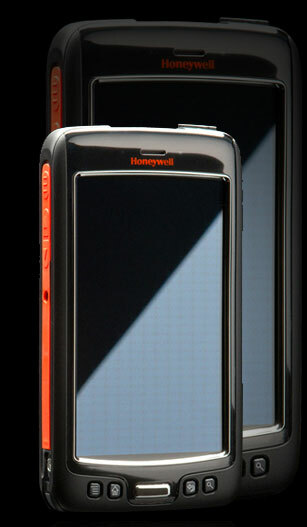 Honeywell is building out their mobile computer product library, spreading into previously untapped territory. 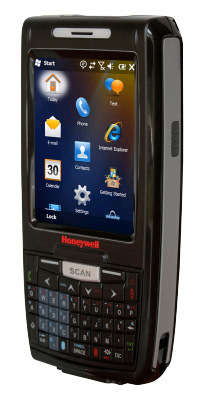 The Honeywell Dolphin 7800 mobile computer is positioned as an economical Enterprise Digital Assistant, and has some great tools to make your work easier. Enterprise Digital Assistant is a fancy way of saying “burlier than a smartphone,” and the Dolphin 7800 fits into this class pretty well. It looks a bit like a cross between their higher end Dolphin 9700 EDA and the Dolphin 6000, which if you average the two out you get 7850. So that’s pretty close. The Dolphin 7800 runs Windows Embedded Handheld 6.5, giving you support for legacy Windows CE/Windows Mobile apps. A TI OMAP processor clocked at 800 MHz drives the software, along with 256 MB of RAM and 512 MB Flash, making the Dolphin 7800 no slouch when running demanding applications. There’s also a microSD slot in case you need to stuff even more storage in there, like route maps, large form databases, or the compiled works of Motley Crue. Home Sweet Home is great to play on a return trip. A 3.5″ LCD display runs in full 640×480 VGA on the Dolphin 7800, which is awfully crisp and shiny. You also get your choice of 30-key numeric or 46-key QWERTY keypad layouts, depending on if you like T9 or tiny keys. Either way, it should be pretty easy to enter data manually. Honeywell built the Dolphin 7800 with Adaptus 6.0 imaging technology, in either standard range with green beam or extended range with laser aimer configurations. The standard range imager should get you about 20″ of optimal scan range for a UPC barcode. I don’t have exact numbers for the extended range imager, but I assume it’s greater than 20″. Long range imaging is making a pretty solid surge, with multiple manufacturers releasing autoranging or extended range imagers in the past year or so. All of the Dolphins come with Bluetooth and 802.11a/b/g/n radios standard, with optional models sporting the Gobi 3000 WWAN radio. Gobi is a fancy pants new radio style that allows you to switch between GSM and CDMA networks on the fly. I’m not sure how often you’ll need to swap from Verizon to AT&T, for instance, but it’s great to have multiple options in case you hit a dead zone for either cellular network. As I mentioned earlier, Enterprise Digital Assistants are burly smartphones, and the Dolphin 7800 is no exception. A magnesium inner chassis and engineering grade plastic housing reinforces the device, so you can drop it a fair bit without breaking it too badly. According to specs, that’s good for a 5-foot to concrete drop resistance. I wouldn’t go throwing this across a warehouse, but it should be fine getting bumped off a table or dropped by a normal height person. The reinforcing also protects it from 1,600 1-meter tumbles, which is a high point for this class of device. The Dolphin 7800 is also built with an IP54 seal specification, meaning windblown dust and water splashes won’t harm the internal components. Honeywell also offers the Dolphin 7800 as a healthcare-specific model. This one comes in hospital white, so it should match your healthcare provider of choice. I think it also makes it easier to spot like dirt & blood & junk on the device, letting you know when you should clean it. And the plastics are specially designed for these cleaning situations, being resistant to various cleaning solutions. Usually, cleaning agents will pit, etch, or otherwise damage plastics, thankfully these healthcare Dolphins are built to not succumb to such a fate. With the small size and durable design, I could definitely see the Dolphin 7800 as a good choice for quick utility meter reading, mobile field crews, or anyone needing durable mobility but can’t carry around a gigantic industrial mobile computer. The healthcare-specific model should be fantastic for care providers, the device is small enough to fit in a pocket, easy to sanitize, and offers advanced scanning to ensure the right treatments get to the right patients. So a few weeks ago Honeywell let us know about a pretty solid new mobile computer they have coming out. I got so excited I listed it right away, then found out it wasn’t available for sale until March probably. But I can’t deny you guys the fun times and info about this for that long. The Dolphin 9700 is a handheld mobile computer designed for delivery services, route management, or pretty much any other data capture scenario. There is a model with health care plastics for the body, so you could drop one of those into a hospital and not worry about etching the case with cleaning agents. For durability, all of them meet IP64 standards for sealing. This means no dirt can get in to harm the components, and it should be fine against sprays of water. I’m pretty sure it’s in the sneezeproof category at that point. It also withstands 5-foot drops to concrete and over 2,000 1.6-foot tumbles. I like to think of the example being you have it on the back of your truck, drive off, and it falls off the truck during a high speed chase, yet it’ll keep working. Honeywell’s crammed their Adaptus Imagers into the Dolphin 9700. Currently, they have specs for the standard range 2D imager on regular models, and the Smart Focus 2D imager on the healthcare models. They also seated the imager at an angle from the top of the unit, so you can scan things in front of you while still looking at the screen. I like to see what I scan while I’m scanning it, so that seems pretty fancy to me. Optional models also can get a 2 megapixel color camera, in case you want to take pictures of the weird rash on your patient that looks like Eric Estrada, or maybe you want to document the boot prints on your shipment. All models come with 802.11a/b/g and BlueTooth standard, and there are options to add GPS and GSM/HSDPA cell radios. Once you cram the GPS and the GSM in there, you have a pretty solid field service and route management solution right there. To really rub it in to the competition that Honeywell’s in it to win it, they’ve bumped up their built-in flash offering to 1 GB, and have a microSD slot on the side of the Dolphin 9700 capable of reading 32 GB cards. I’m pretty sure with that size card, and the GPS, you could have a route management system for the solar system. And that’d be pretty bodacious.